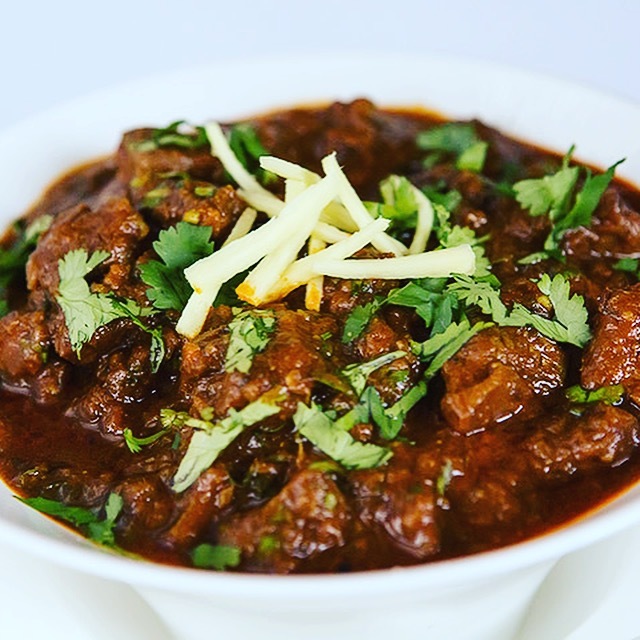 Punjabi lamb curry is the highlight in a carnivore Punjabi’s kitchen. With the cold winter fast approaching it will defiantly warm you up from the inside, whether it be the warmth of the spices or the warmth of fulfilment. We grew up eating this lamb curry and I was taught by my dad who was a master at this. My version uses ingredients you tend to have in your pantry as whole spices weren’t readily available when my parents first moved to England, this dish worked then and most certainly still holds it’s magical appeal. The thick gravy can be mixed with rice when eating or scooping it up with roti or naan. My dad would make a huge pan of lamb curry when he’d be hosting a drinks party with his friends. They would eat bowls full whilst drinking their whisky and these are the fond memories we all like to cherish. Give my lamb curry a try and you’ll end up creating happy memories of your own. 1Heat the oil on a medium/high heat in a large saucepan. Add the cumin seeds and let them sizzle, when you smell the sweet aroma of cumin add the onions and salt. Cook the onions for 8-10 minutes until they're caramelised and a deep shade of brown. 2Add the ginger and garlic and cook for a couple of minutes stirring continuously as the fibrous ginger trends to stick to the bottom of the pan. Reduce the heat to low and follow with cumin powder, coriander powder, Kashmiri chilli powder and turmeric then cook for around 1 minute. You need to let the spices cook and start releasing their oils, please make sure you stir all the time to ensure the spices don't burn. 3Add the tomato puree and cook for 1-2 minutes. Increase the flame to medium then add 250ml of hot water and reduce the mixture again, this should take 4-5 minutes, it sounds weird but it will really helps develop the flavours in your gravy. 4Add the lamb and stir with the fragrant masala. Cook for 5-7 minutes stirring continuously. 5Add 750ml of hot water from the kettle and stir throughly scraping down the sides for any caramelised masala residue. Put a lid on the pan, reduce the heat to medium/low and simmer for 30-35 minutes stirring every 3-4 minutes. 6Once the lamb has cooked, if you prefer to have a runnier sauce add more water from the kettle and cook for 2-3 minutes. Stir in the coriander and garam masala. Serve with pilau rice, naan or roti. Superb Recipe, thanks so much for that, worked really well, lamb melted in in the mouth. I used stewing lamb with bone in and the flavours are lovely! Great recipe! Thanks! Wow ! Its very nice !! I added bit of Asafoetida. Just testing this spice. But the recipe its nice. Would you add some recipe with lamb and lentils my friend please. I love this combination but have problem to cook nicely. Kashmiri chilli powder isn’t very hot but gives a rich red colour. Try it with half the quantity of chilli powder and if it seems mild add the other half. Good luck! Hi- Add 250ml less water and see how it work out. I wouldn’t recommend you add a thicker but taking the lid of will help but do it once the lamb is cooked 2/3 of the way through! I’d like it a little thicker. Can I leave the lid off or add thickener? Getting ready to make this dish tomorrow. Just wondering how hot is the Kashmiri chili powder? Most of the family are wimps when it comes to heat. Don’t want to make it inedible. Thanks. I just tried this over the weekend and I am glad I did. This was my first attempt at home-made curry and I don’t think the instructions could have been made any easier. This recipe is definitely going into my repetoire of meals. Thank you for sharing! It isn’t! i hope it works out for you! I made this a while back and it was so flavoursome. The lamb melted in our mouths it was so tender. Even though it takes longer, it is far better than having a takeaway! Asian food stores stock it. It is also called Deggi mirch. Where can I buy Kashmiri chilli from? I have never cooked in a slow cooker but looking at the guidelines it should take 6-7 hours on a low setting? Stage 5 would be the right time to add it to the slow cooker! Let me know how it turns out for you! Could you do steps 1-4 as above, then at step 5 add to a slow cooker? If so, for how long? It’s 1kg of boneless leg of lamb! Lookds delicious Tjks for sharing and a must try. May i ask weight of lamb to be used for this recipe.? Thank you.